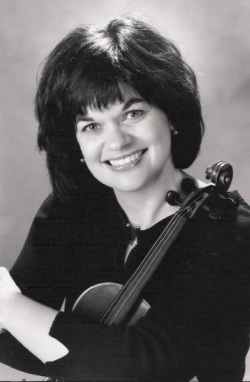 Canadian violinist Catherine French, a member of the Boston Symphony Orchestra since 1994, has established herself as a versatile and accomplished soloist and chamber musician in addition to her distinguished orchestral career. Ms. French garnered the grand prize at the Canadian Music Competition, the C.B.C. Radio Competition and the National Competitive Festival of Music, Canada’s three major music competitions. She has performed as soloist with many leading Canadian orchestras and given recitals throughout North America and Argentina. Ms. French was featured with the Juilliard Orchestra & James de Preist, the Boston Pops & John Williams, and at Carnegie Hall in her debut with David Gilbert. Lauded for her “superbly lyric” playing and her “amazing level of artistry” by Strad Magazine, Ms. French is a dedicated member of the Calyx Piano Trio and Collage New Music. Her avid interest in chamber music has led to performances at the Marlboro, Banff, Portland, Carolina and Missouri chamber music festivals, quartet tours of Germany and China and annual concerts as part of the Prelude series at Tanglewood and the Curtisville Consortium. Ms. French has recorded for Albany Records and is featured in Donald Sur’s Berceuse for Violin and Piano with pianist Christopher Oldfather. Catherine French began Suzuki violin at age four then continued her studies under the esteemed Canadian pedagogue Dr. Lise Elson. Ms. French graduated from Indiana University with a Bachelor’s of Music degree and a Performer’s Certificate, then earned a Master’s degree from the Juilliard School. Her teachers were Miriam Fried, Felix Galimir and Joel Smirnoff.